In many ways I have reached the age where I want to have a life driven by travel, people, passions and emotions and if a drink was going to take you on a journey I would say whisky would be that. My background prior to running Gentlemans Butler which focuses on finding the best was as a television and commercials producer which as an industry is certainly known to like a long lunch, a good chat and likes a tale or two so when I recently met Jon Purcell from Spiorad Publishing www.spioradpublishing.com who also has a similar background to mine, but as a stills photographer in the commercials field we indeed had plenty to natter about. We spoke about how we look for excellence, the making of the book, the choice of paper, its strong binding which means you can view the pages flat as well as about the journey he had been on. The origins of Whisky or Whiskey depending on your slat is routed in the cultures of Scotland and Ireland which of course are interlinked if you go back in time but for me with my modern-day hat on I am intrigued about why Whisky has almost taken on a cult status and in particular its Asian expansions. For me, though it might sound cheesy Lost In Translation does conjure up a lot of its kudos but for many they will prefer to experience this within the rugged and beautiful scenery of its birthplace. You will find both in this book. Either way this for me if as much about the people, scenery, culture and history that Whisky is the baby of. You genuinely will be hard pressed to find much better. I just love to escape into the photography and words and let the mind wander…. My role if you like is to split the wheat from the chaff, sorry had to get that in there and look from outside and introduce Jon and his amazing book. One of the joys of travel is when you have a passion that takes you to new places and wonderful people. My own take on whisky is similar to our view on most things which is to enjoy. For example, I do not get a kick out of going to a restaurant where they serve some strange lumps of Aztec mushroom surprise on a baked coke can just because its different, whacky or whatever. I want wholesome food, served with passion at a table where I am comfortable. Thus we believe a whisky is meant to warm you physically and emotionally. We have been lucky enough to be allowed to publish some extracts of the book. This will hopefully give you a window onto or out of depending on your perspective. Many a bar room discussion has tried to pin down where whisk(e)y was first distilled. Much to the annoyance of most proud Scots, the weight of evidence indicates that it made its debut on the island of Ireland. Not only that, but Ireland is the country that first introduced whiskey to the four corners of the world, which makes it by far the best place to start our journey. Whiskey, along with legend, are an integral part of this area’s heritage. After the dissolution of the monasteries between 1536 and 1541, the art of distillation continued to be practiced by the newly unemployed monks as a way to make ends meet. Gradually their knowledge propagated into the general domain as the locals got a taste for their water of life. THERE IS SOMETHING WONDERFULLY IRISH ABOUT THE WAY PADDY GOT ITS NAME. BACK IN THE EARLY 1900S WHEN THE CORK DISTILLERIES COMPANY’S OLD IRISH WHISKEY WAS ONE OF THE MANY BRANDS VYING FOR LOCAL MARKET SHARE, A GREGARIOUS GENTLEMEN BY THE NAME OF PADDY FLAHERTY WAS THEIR SALES REP FOR THE SOUTH-WEST REGION. HE GOT QUITE A REPUTATION, IN FACT YOU COULD SAY, HE WAS VERY GENEROUS IN SPIRIT, AND THE SPIRIT IN QUESTION WAS THAT OF HIS EMPLOYERS. For many years the Campbeltown distilleries had prospered, their distinctive style was highly prized, and thirst for their big bodied, heavy, oily, smokey whisky grew exponentially. The craggy hills that surround Lagavulin Bay are steeped in history. Standing on the eastern headland, guarding the inlet are the cannonball battered remains of Dunyvaig Castle. Once the stronghold of the Lords of the Isles, until a battle in 1615, when Sir Oliver Lambert working on behalf of King James gained the upper hand. Adjacent to Islay and next in the chain of the Inner Hebrides lies the sparsely populated Isle of Jura, its name derived from the Nordic meaning ‘deer island’ was given by the Vikings, who found thousands of the animals roaming the land during their occupation in the 9th century. The deer remain to this day and outnumber the 180 Islanders by a ratio of at least 50 to 1. 1941 was not the best of times to be at sea off the British coast. Nazi U-boats were often loitering ready to attack merchant ships. In just one year between July 1940 and June 1941, nearly 500 British cargo ships were torpedoed. To beat these odds two tactics were adopted; large convoys were organised and escorted by Royal Navy warships, or individual merchant ships made a dash for it, in the hope of avoiding the U-boats. Three and a half thousand feet up in the Cantabria mountains in an ancient forest first planted in the 16th Century to supply timber for the building of the Spanish Armada, a tiny sapling has germinated from a fallen acorn. Next to the freshly sawn stump of the Oak tree that bore the fruit, as it’s roots gain a footing and it begins to flourish, the cycle of life begins again. Situated in the north-eastern county of Yilan, surrounded by a patchwork sea of rice paddies the Kavalan distillery feels about as far from whisky’s Celtic roots as you can get. Its pair of twin pagodas shimmering through the subtropical heat haze may seem somewhat surreal, but this is no mirage. Having long produced alcohol, principally from rice, the story goes that whisky was introduced to Japan by Commodore Matthew Perry in 1854, on his ‘diplomatic’ mission to reverse Japan’s 220-year old policy of national isolation. ICE WAS ONCE RESERVED SOLELY FOR THE EMPEROR’S USE. HIS SUBJECTS WOULD TRAVEL HIGH INTO THE MOUNTAINS TO CUT OUT HUGE CHUNKS OF COMPACTED FROZEN SNOW AND STOCKPILE IT IN CAVES SO IT WAS READILY AVAILABLE WHENEVER HE DEMANDED. Japan’s neon-lit capital is a marvellous place if you are looking to try, compare and contrast fine whisky. 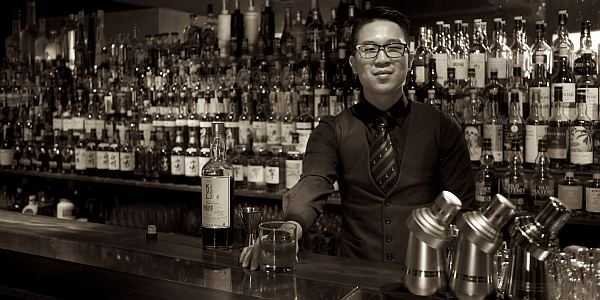 From tiny hidden basement speakeasies boasting collections of hundreds of rare Scottish and Japanese single malts, to elegant cocktail lounges in towering skyscrapers, dozens of bars across the city offer extraordinary choice, available by the measure and served with knowledgeable guidance. Step out of the lift on the 52nd floor and let your eyes adjust to the soft candle light. The murmur of conversation and smooth jazz melodies emanating from the grand piano soothes, while framed through the triple-glazed, double height picture windows, the frenetic city silently sparkles away, seemingly off to infinity. Take a seat at the bar, this spot, sought out by both movie buffs, and whisky geeks is where in 2003, Japanese whisky came to the attention of the masses. Having now met and spoken with Jon on several occasions I have been majorly impressed by his dedication and professionalism and now that I have had time to delve into this wonderful book which would be perfect for a luxury hotel or bar for their guests to read or for a private individual to have on their private yacht or jet or indeed in their drawing room or library I can say without any arm twisting I am seriously impressed and feel positive you will be too. Switch off everything that is digital, light a roaring fire and maybe whilst the gales blow outside you can unwind and drift away whilst partaking in a tipple or two. Life is about you defining your own journey, not being dictated to so if life lets you maybe one day you can pack a bag and get in your Jenson and a copy of THE ART IN WHISKY and follow your own whisky journey. Its certainly inspired me ….